As many of you know, I am so passionate about living my life through food, that it is hard for me to keep all of my ideas and enthusiasm to myself. It is for this reason that I have started this blog - for us to connect through sharing fun food facts, survival tips for time-starved families, and finding new ways to explore the world of food. I hope that you will join us as we begin our journey. Would you like to share your knowledge about quick easy dinner? Great, find out how you can submit your story or tip here. 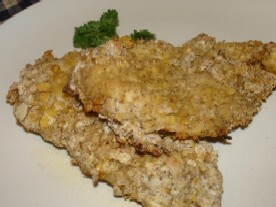 Continue reading "Contribute to Quick Easy Dinner"
Buttermilk Oven Fried Chicken a quick easy dinner recipe that is baked instead of fried to be lower in fat. Kids will love the crunchiness. A country favorite made healthier. Continue reading "buttermilk oven fried chicken"
Pasta Parsley Pesto recipe for quick easy dinner during the winter. Pesto is made from parsley and walnuts which are less expensive than basil and pinenuts during winter. Kids will love. Meatless. Continue reading "Pasta Parsley Pesto"
Goat Cheese Pesto Crostini recipe for a quick easy appetizer that will impress your party. Make fresh pesto from your garden or purchase ready-made pesto to save time. Can be served hot or cold. Continue reading "Goat Cheese Pesto Crostini"
Garlic Herb Shrimp for a quick easy dinner, elegant appetizer, topping for salad or a light summer lunch. Serve shrimp hot or cold, use fresh herbs from garden, kids will love. Continue reading "Garlic Herb Shrimp"